K V N S Srikanth from Rajamahendri, B.E. - B.Tech Graduate. 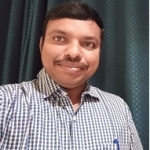 MY SELF SRIKANTH PUR.. OIL & GAS AND CPG &..
are one of expert skill area's of K V N S Srikanth . K V N S Srikanth is working in Power and Utilities industry. OIL & GAS AND CPG &..